Regan had also accused her former employers of asking her to lie to federal investigators about Bernard Kerik, the former New York City police commissioner who was once her lover, and had tried to smear her. Regan said the smear campaign stems from her past intimate relationship with Kerik, who was police commissioner under former Mayor Rudolph Giuliani, and from the political agenda of News Corp. Sounds like Rudy Giuliani will breathe a little easier tonight. While she doesn't address her lawsuit against News Corp, there's plenty there that shows how her life tumbled after her firing. For a look back to what she said at the time about her OJ book, check out Why I Did It. Frank Rich on Rudy and "That Regan Woman"
Frank Rich has a terrific column today in the New York Times on what Judith Regan could tell about Rudy Giuliani. It's also a succinct recap of the various elements of the story to date, from Bernie and Judith to Bernie and Rudy to Fox and Rudy. Whether Ms. Regan’s charge about that unnamed Murdoch “senior executive” is true or not — her lawyers have yet to reveal the evidence — her overall message is plain. She knows a lot about Mr. Kerik, Mr. Giuliani and the Murdoch empire. And she could talk. Who's the Unnamed News Corp Official in Regan's Lawsuit? Wayne Barrett of the Village Voice believes the first of the two unnamed senior Fox officials named in Judith Regan's lawsuit is Roger Ailes. He's said so on Countdown, Democracy Now and the Abrams Report. Salon has more. "The funny thing about Judith Regan's complaint is that she doesn't refer to Roger Ailes by name for the first 16 pages, right?" Barrett told Keith Olbermann of MSNBC on Wednesday. "But Roger Ailes is ... clearly the person she is referring to as this senior executive who made all these suggestions to her." The next day, on "Democracy Now," host Amy Goodman opened her segment with Barrett by stating as fact that "Regan ... was talking about Roger Ailes." Barrett responded, "I'm sure you're correct." The candidate laughed when reporters asked for his response to one-time publishing powerhouse Judith Regan's $100 million lawsuit claiming that her former employers directed her to lie to federal investigators about Kerik because of the implications for Giuliani. "I don't respond to the story at all. I don't know anything about it. And, it sounds to me like a kind of gossip column story more than a real story,"
That's Rudy, burying his head in the sand with an "I don't know anything about it." Will the press leave it at that? Maybe now this story will gain some traction in the media. 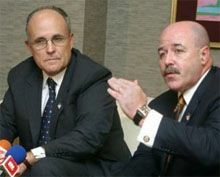 It's been way too lenient on the connection between Bernie Kerik and Rudy Guiliani. There were headlines for one day and then no one asked the tough questions, the ones about what Rudy knew about Bernie and his alleged ties to mob associates and a company with alleged ties to mob associates and when he knew it. Regan alleges in the lawsuit that a Fox executive told her to lie to federal investigators about her relationship with Bernie Kerik in order to protect Rudy Giuliani. She says another Fox exec told her not to turn over relevant documents. Ms. Regan had an affair with Mr. Kerik, who is married, beginning in the spring of 2001, when her imprint, Regan Books, began work on his memoir, “The Lost Son.” In December 2004, after the relationship had ended and shortly after Mr. Kerik’s homeland security nomination fell apart, newspapers reported that the two had carried on the affair at an apartment near Ground Zero that had been donated as a respite for rescue and recovery workers. Fox claimed it fired Regan for alleged anti-semitic comments.